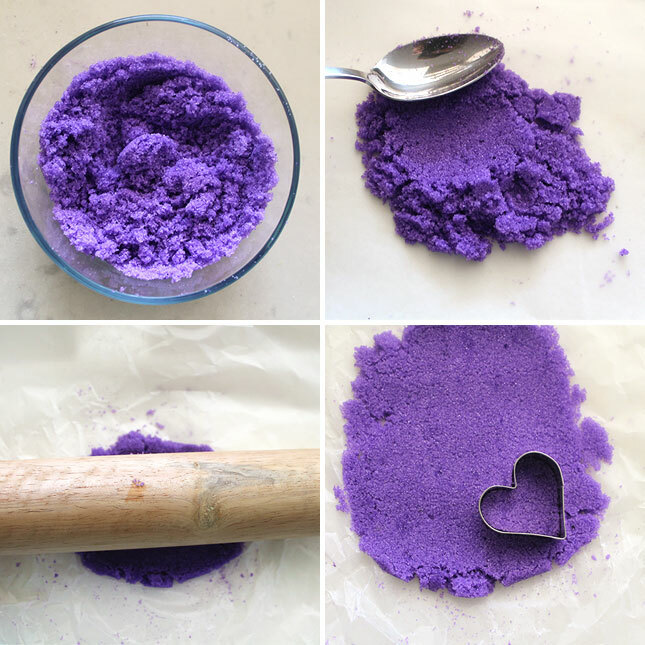 The first step is to pour the first 1/2 cup of sugar in a bowl and add a few drops of the first desired shade of food coloring. 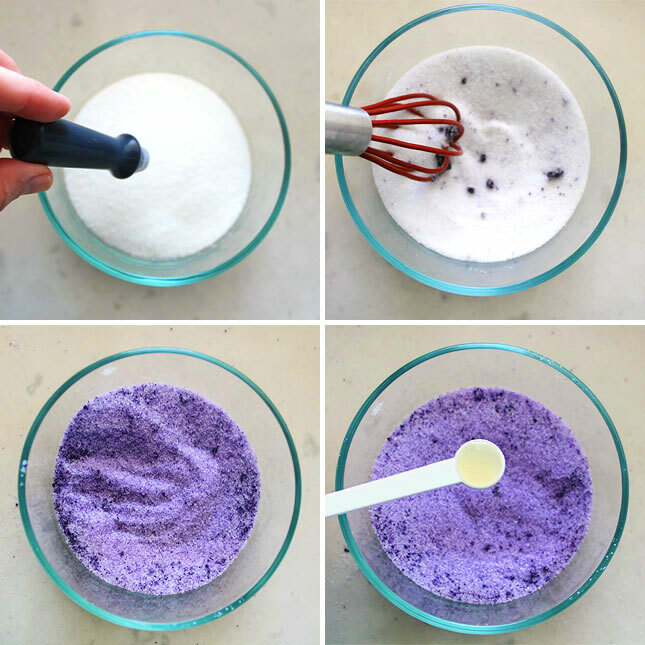 Because gel food coloring is super concentrated, start off with only a drop or two and whisk like crazy. The coloring should disperse, if not and you have a few hunks of food coloring and sugar that just wont whisk away, No Worries! That’s where the egg whites come in! Add in said egg whites at 1 teaspoon for each color and keep on mixing. 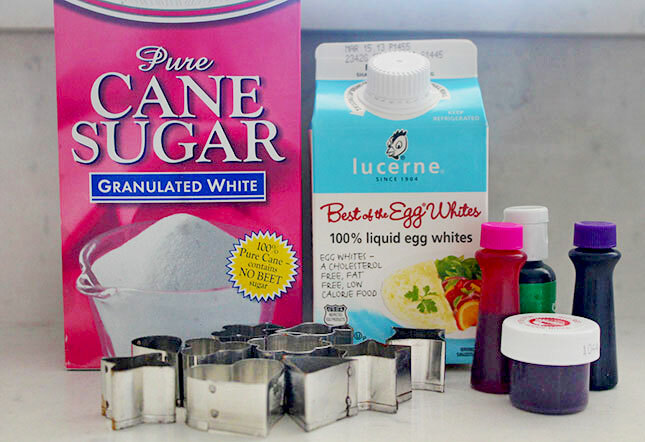 Once you add in the egg white, the sugar should undergo a dramatic change and those colored clumps will disappear. MAGICO! At this point, your sugar should resemble damp sand — the kind that rules for sand castle construction. On parchment paper, lay out the sugar and flatten it with the back of a spoon and a rolling pin to make a sheet about a quarter inch thick. It should be packed together tightly. If you find that your sugar is too crumbly, put it back in the bowl and add a drop of egg white until it’s more workable. 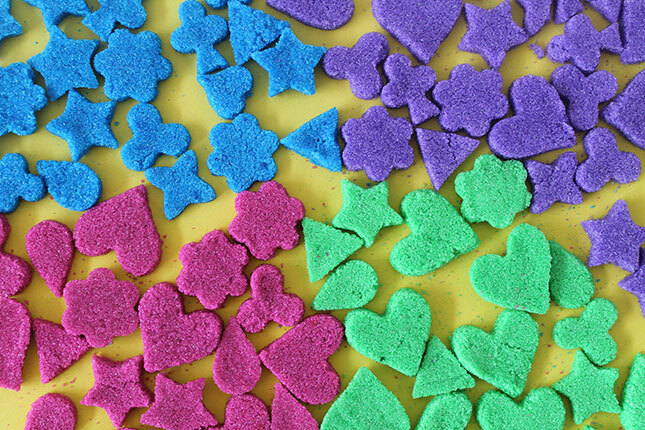 Using your cookie cutter, cut out hearts and other shapes and lay on a separate cookie sheet. *Courtesy of our favorite blog. EVER.-> Brit&Co. Previous post Influenster’s Holiday Vox Box Reviews! Next post Wrap Your Valentine In Velvet – Red Velvet!